It was a spectacular day chez Johnson. The Gort dressed for school and then, after coughing a couple of times, determined he was sick and needed to stay home. And, for some reason, we let him. The morning flew by and at 12.20pm, we had not even dipped into the Halloween candy. Paragons of self-restraint and all things virtuous. Though, from 12.21 onwards, the rest of the day was an abomination. A blur of sugar and…pumpkin carving…and Angry Birds. I’m not sure it is humanly possible to waste any more time than I did on Tuesday. It began with the pumpkins of course. 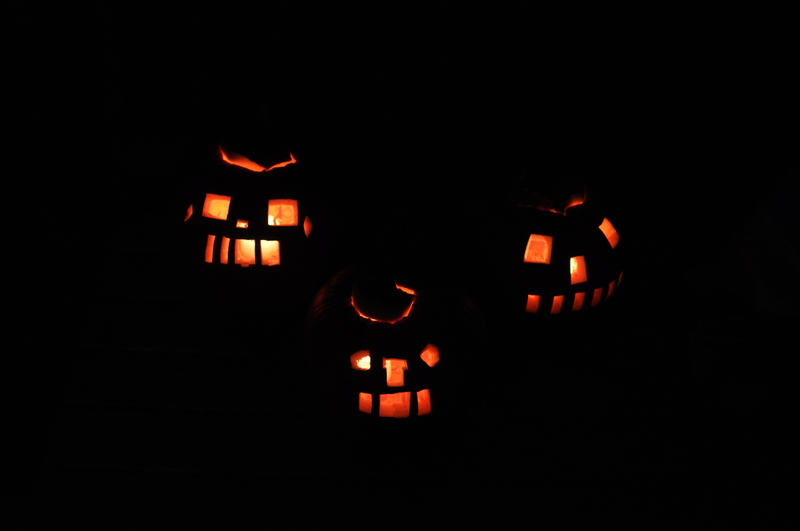 The three, rather large, pumpkins I purchased last week….and never carved. There was a cold snap and part of me was actually glad I’d procrastinated on the cutting and scooping and didn’t have dilapidated jack o’ lanterns on my hands, but then it was Tuesday. November 1st. And I had to ask myself: why had I purchased these gourds? ‘Can we roast pumpkin seeds today?’ the Gort asked for at least the third time in as many days. Apparently he’d learned from his second grade teacher that one could roast pumpkin seeds ‘with butter and salt’ and….. And I don’t know what he expected to happen after that. Naturally, in order to roast pumpkin seeds, one must unearth said seeds. Preferably by carving a pumpkin. So my oldest boy-child brought all three – very cold – orange gourds inside our home and proceeded to ‘draw’ on their respective exterior his preferred designs. I followed his instructions, for the most part, straying only occasionally to straighten certain lines, and for the purpose of creating skeletal teeth. ‘Thanks for doing that, mom’ my oldest voiced his appreciation when I produced a set of tremendous teeth. As though I’d just performed an act of considerable generosity. ‘Do you think we should put these on Facebook?’ he mused aloud, as we stood back and surveyed our ‘handiwork’. I laughed out loud, as I tend to do when my children say things I think are funny. ‘What do you know about Facebook?’ I asked my seven year old? ‘Well, every time I go into your office it’s on the computer,’ he explained the source of his knowledge. I sprinkled some salt on a handful of butter-laden pumpkin seeds and put them in the oven. Having no clue as to oven temperature or how/if one actually eats the seeds. When they emerged from my possibly-too-hot-oven several minutes later, the Gort looked at them. Disappointment written all over his face. ‘That’s not what I thought they’d look like,’ and he declined to sample the culinary treat. I nibbled a few and then I worried that I was eating the wrong ‘part’ of the seed, or doing something really stupid, so I threw them in the trash. Frankly, the bits I sampled weren’t particularly tasty. And then Percy woke up and next thing I knew – I was sitting in front of the computer playing Angry Birds. A craze I managed to avoid until about a week ago, when I finally caved and played a game. I didn’t even enjoy it, but felt compelled to finish all the levels. Which is why I spent over an hour trying to ‘finish’ level 3-20. The professor phoned around 6pm. ‘I’m just waiting for the bus,’ he informed me. ‘I’m just waiting to figure out level 3-20,’ I informed him. And he laughed because he knew all too well that I’d done nothing but stare at a computer trying to do my utmost to sling birds into pigs. ‘I don’t think you’re going to get it, mom’ the Hen (who was perched on my one leg as I tried to garner victory over 3-20) told me. ‘Yeah, I don’t think I am either,’ I sighed, wondering just how many hundreds of games I would be willing to play to move on to the next level. ‘You should just skip this one,’ my oldest sighed irritably, when it became clear I would not let them play anything until I figured out the game. Meanwhile, Percy had gotten into someone’s Halloween candy bucket and kept running into the room at different intervals, chewing on different pieces of candy. Caramilk. Aero. Suckers. I was only mildly concerned on account of the 3-20 conundrum. Suddenly, miraculously, I managed to demolish all of the green pigs. The joy I felt was genuine. Albeit shortlived-and-leading-to-overwhelming-feelings-of-patheticness. Afterwards, I leapt from the screen and turned my attention to something more productive. Like feeding my boys something besides candy. And vacuuming up the bits of spray paint that had shed from the Lego Minifigure costumes. And doing my best to look like I hadn’t wasted the bulk of my day trying to crush animated pigs. I vowed never to touch Angry Birds, ever again. And then the boys told me last night that there are ‘other’ hidden levels and you’re supposed to hit these Google Chrome icons to open those levels. And now I’m wavering between wanting to be a responsible human being…..and wanting to see those other levels. I want to celebrate Halloween in the land where you get Caramilk as a treat. Hi. Randomly found your blog today- but here’s a no fail pumpkin seed recipe: soak freshly excavated pumpkin seeds in salt water for 12-24 hours, drain and place on a baking tray in the oven at 300f for about 20 minutes until lightly browned and crispy, turning once. Can eat them whole or shuck the outside (like sunflower seeds) and eat the ‘green’ innards, good on spinach/ cranberry salads, pumpkin soup….. Good luck! Angry birds is fine as long as you don’t ever start playing. Because once you do, suddenly it’s an hour (or two) later and you don’t know where the time went! I try to avoid it at all costs 🙂 Speaking of though, it made me think of a brilliant Halloween costume idea I saw. I will forward you a photo – you’re just crafty enough to execute! I will send you some Aero and Caramilk for Christmas. Nicole, thanks for the seed-tips! I was thinking I missed a step. Or three. Rachel, I’ve successfully laid off the Angry Birds…..